A vacant house on the outskirts of Munich. People are gone. What is left? 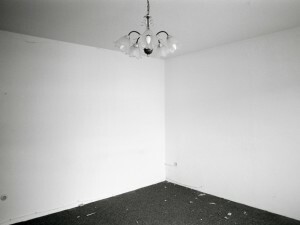 Empty rooms, a chair, a ruffled curtain. Traces and memories. The neighbors speak from their point of view. Friederike Guessefeld was born in 1984 in Hamburg. From 2004-2007, she studied Communication Science and German Literature. Since 2008, she has been a student of Documentary Film at the University of Television and Film in Munich. From House to House (Von Haus zu Haus, 2009) is her first film.